Scientific Name: Root Knot Nematode - Meloidogyne spp. 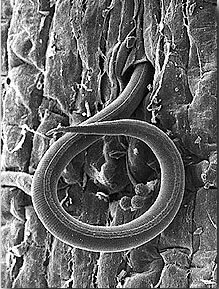 Steiner Nematode - Steinernema carpocapsae (the most commonly available beneficial nematode). There are many other species of both troublesome and beneficial nematodes. Hederohabditis is the genus available for use on fire ants and grubworms. Nematodes are tiny, wormlike animals found in soil all over the world. Scientists think there are about half a million different species of nematodes. Some are crop pests themselves, while others are crop protectors. Nematodes like the kind Shapiro-Ilan uses are valuable because they cause disease in destructive bug pests, but don't harm humans, other animals, or the environment. Nematodes, like the one shown infecting this tomato root, are tiny, wormlike organisms that wriggle into their hosts--whether they be plant or insect. The nematodes take care of that part themselves by worming their way into a bug while it's still alive. Then the nematodes multiply inside the bug (which eventually dies) and finally burst out of the bug body! 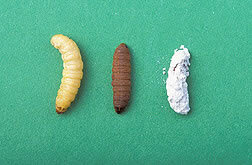 The number of nematodes inside a single bug–depending on the species–ranges from 10,000 to 500,000. Although you can barely see one young nematode with your naked eye, you can't miss large groups of these tiny wigglers pouring out of the dead insects in what Shapiro-Ilan says looks like an explosion. Then the nematodes wriggle off to find other insects to "invade," starting the whole cycle all over again. 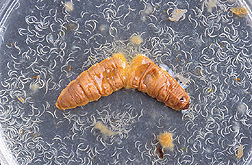 Photo of a nematodes bursting out of dead wax moth larva. How do nematodes help protect crops? Shapiro-Ilan is using the nematodes as a natural replacement for chemical bug sprays, or insecticides. After new nematodes hatch inside the dead bug hosts, they're placed in orchards or greenhouse soils. 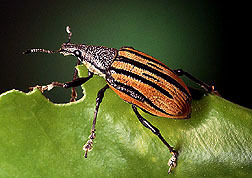 The nematodes protect crops such as citrus, pecans, cranberries, and mushrooms by killing pests that live in the dirt, such as citrus root weevils and black vine weevils. 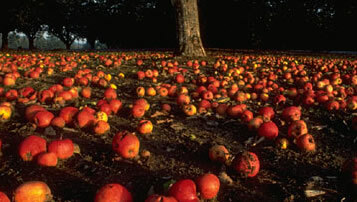 Photo of fallen apples around a tree.